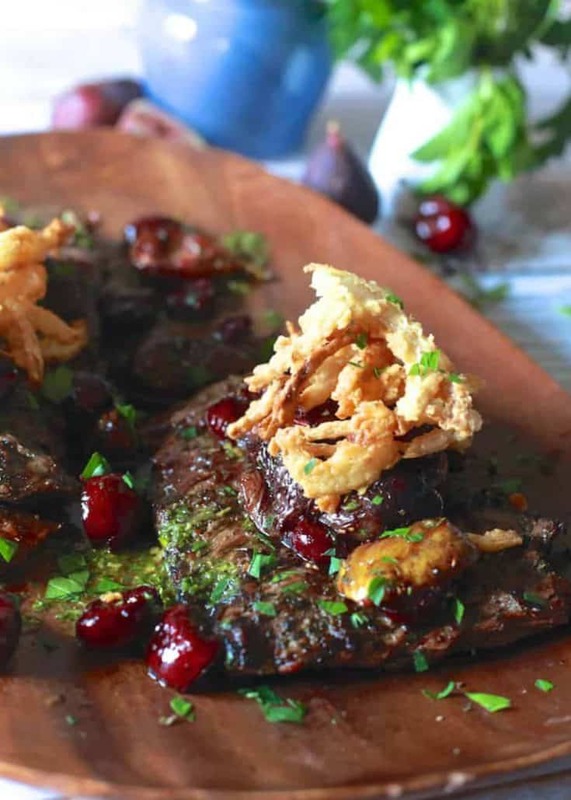 Grilled Skirt Steak with Roasted Cherries & Figs | When you think of summer dishes you think them made up of brightly colored fruits and vegetables. But, summer also has some rich dark fruits like cherries and figs. August is the month when the seasons of these two fruits overlap. I know! I can’t believe it’s August already! But, don’t be sad although August is the start of the end of summer on the upside, it’s also the beginning of fig season. One of the things I love about cherries and figs is their rich flavor when roasted. They almost taste like a sweet red wine, gently opening the door that will lead into fall but still holding a foot firm in summer. Reminiscent of our own battle of not wanting summer to end but still yearning for the cool breezes of the fall. I am always torn this time of the year. Excited that cooler temperatures are around the corner, but sad that summer’s abundance of produce will soon come to an end. The thought of no more green beans, sweet corn or juicy peaches makes me sad. Still wanting to hold on to this last bit of summer OB and I have been doing a lot of grilling. This weekend I marinated some skirt steak in a mixture of olive oil, mint, parsley, and rosemary. OB was charged with the task of grilling. Remove the skirt steak from marinade and let sit on the counter for 30 minutes to allow to come close to room temperature. Get the grill super hot. 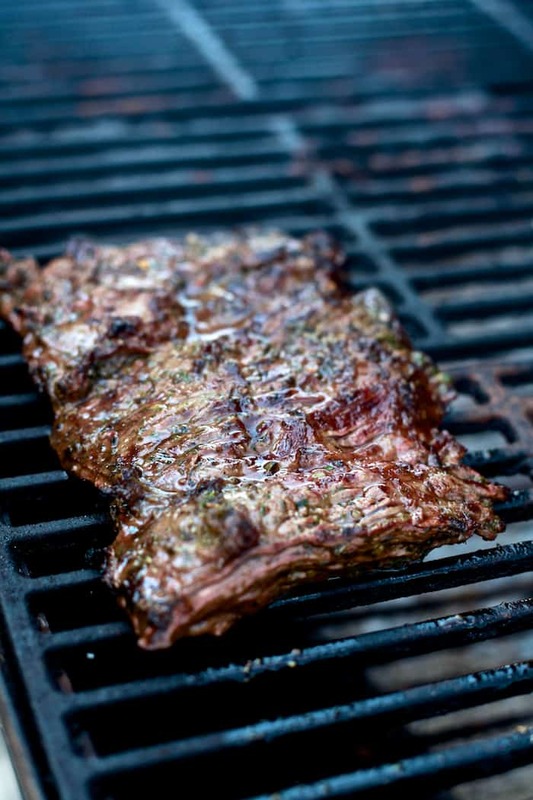 Do not place the skirt steak on the grill until the grill is hot. A single cut of skirt steak can have varying thicknesses. Cut the skirt steak into manageable pieces with roughly the same thickness. Once you put it on the grill don’t mess with it, don’t poke it and for heaven’s sake don’t press it! The only time you should touch the meat is to turn it and to pull it off the grill. This allows the meat to get all crispy, charred and amazing. Grill the steak for 3 to 5 minutes on each side, until done to the degree of doneness you prefer. Let the skirt steaks rest for 5 minutes before slicing to serve. Slice the skirt steak AGAINST THE GRAIN. Skirt steak has long muscle fibers that will be incredibly chewy if not cut properly. Top grilled, charred meat with roasted cherries, roasted figs and crispy onions and you will be voted ruler of the world. I love this dish for its simplicity and depth of flavor. It’s one of those dishes that is easy to prepare but still makes you look like a rock star. If you hang around here enough, you may notice that I have a deep love for combining sweet and savory. Like the time, I made those crostini with strawberries or that pot roast with blueberries and mushrooms. I don’t believe it has to be all sweet or all savory and this dish is further proof that sweet and savory are a match made in heaven. 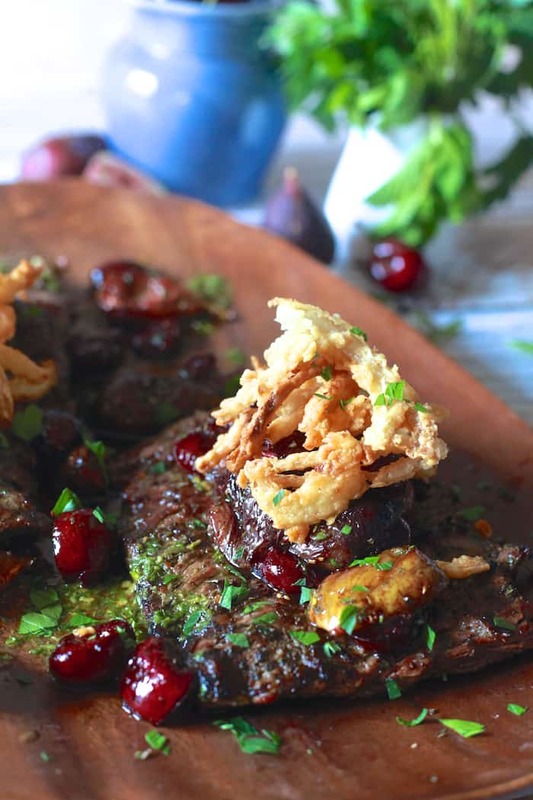 Marinating the steak in olive oil and mint gives it a taste reminiscent of lamb without the gaminess and the roasted cherries and figs will make your heart leap. At the very last minute, I decided to add some crispy onions rings and I am so glad I did! Adding that element of crunch really took this dish over the top. If you love skirt steak as much as I do you will love these fall spiced skirt steak tacos with blackberry and pear slaw or this skirt steak and sweet potato stir-fry with chimichurri. For more amazing beef recipes visit my beef recipe collection. Sweet and tart roasted summer fruits over marinated and grilled skirt steak, topped with crispy onions. Remove any silver skin from the steaks and season with salt and pepper. Pre-heat oven to 400 degrees. Combine all ingredients in a food processor and process until smooth. You can also use an immersion blender if you have one. Place steaks in a resealable plastic bag, pour 3/4 of the marinade over steaks. Seal tight removing as much air as possible. Let marinate in the refrigerator for 30 minutes. While steak is marinating combine all ingredients for fruit topping. Spread on a sheet pan lined with parchment paper. Roast in the oven, until tender and caramelized about 30 minutes. Prepare onion straws if desired. Build a medium-hot fire in a charcoal grill, or heat a gas grill to high. Cook 3-4 minutes per side until meat is nicely charred and medium-rare. 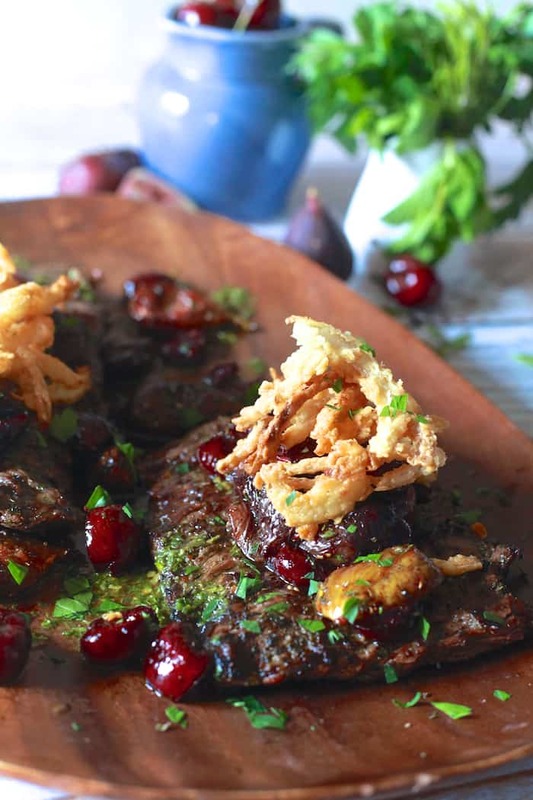 Top steaks with roasted fruit, drizzle with remaining dressing and top with crispy onions. Garnish with minced parsley and a finishing sprinkle of salt. This looks amazing. 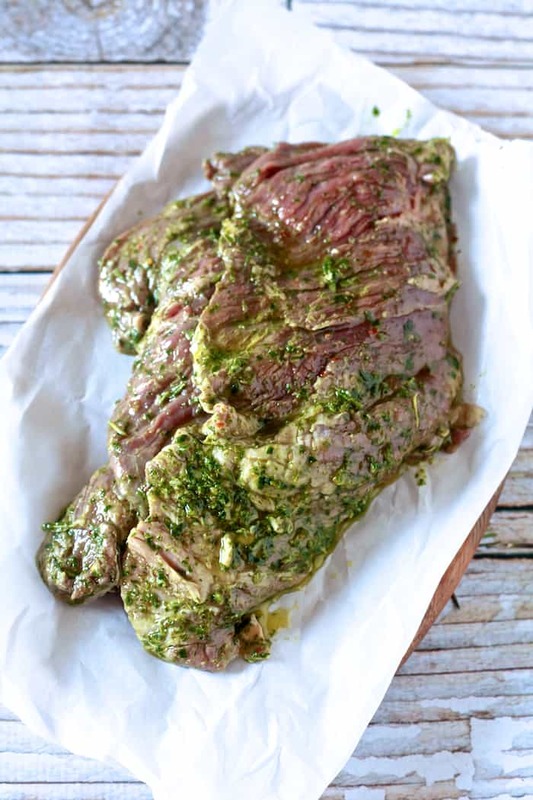 Since skirt steak can be very tough – do you think I could marinate this overnight or at least 8 hours? Thank you! Yumm! 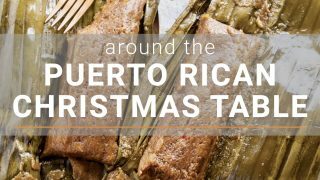 Love the savory and sweet to this! Just had smoked fish with apricots and peaches in an island in Italy this summer and reminds me of these flavors!! I have no words. I want that. In my mouth. Now. steak and cherries? I love this idea! What an amazing combination of flavors, textures and colors! Roasted cherries are the best! I used them once for a cocktail and now I know I need to use them in savory dishes! OMG My bf would love this. And must I also add, your photography is gorgeous!!! Pinning away! 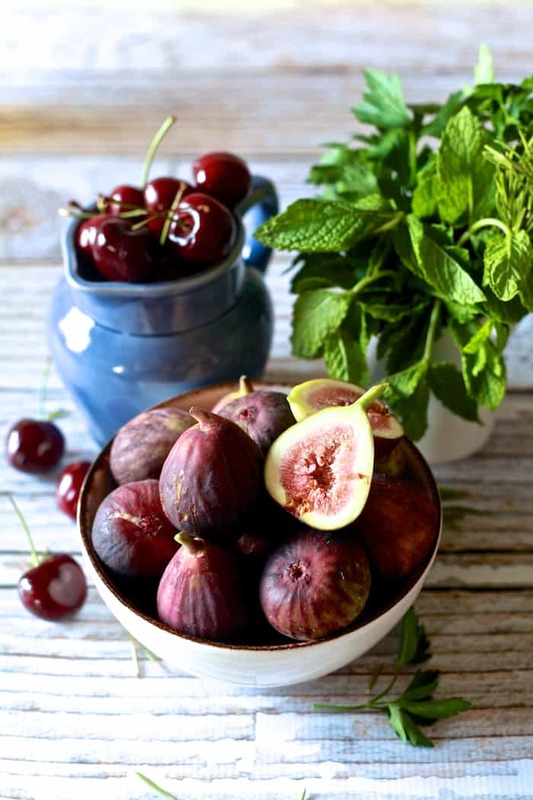 Roasted cherries and figs – divine! Add to that the herby marinade and it’s must make! This dish would be perfect for my son. Maybe I’ll make it as his birthday dinner. Holy YUMTASTICNESS!!!! Totally salivating right now. This steak is making me drool at 7 am! 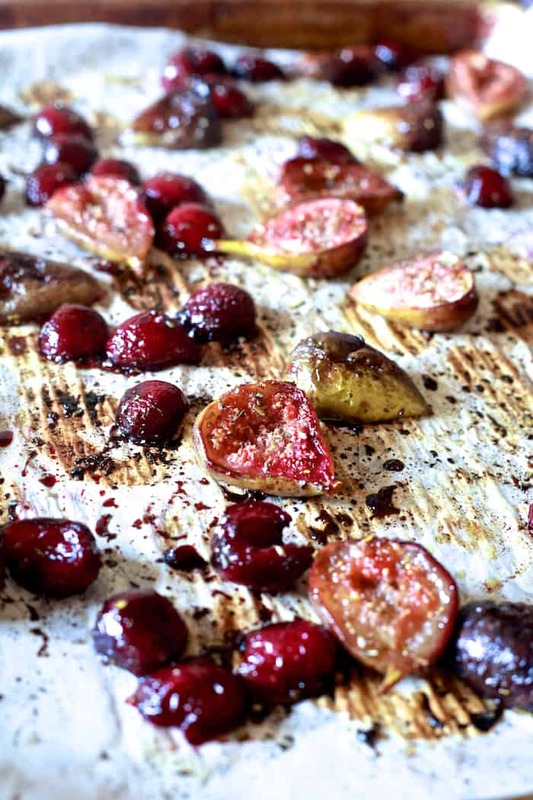 I love that you roasted the figs and cherries, beautiful pics as always! Thanks Lora! I am a huge skirt steak fan too! I am absolutely head over heels for this steak! I began my love affair with figs last year and never would have thought to roast them let alone put on top of steak ( my other love)! Pinning! Roasting figs is a great way to pump up their flavor! I love the sweet and savory together, too 🙂 It truly is the best combo. Great recipe – beautiful photos! Thanks Ashley! Your so sweet! Oh, I want this!! Sounds so tasty! Pinned this so I can make it soon! This is divine!! I love the cherry and figs on here. This is so elegant looking and completely doable. Thank you so much! I love making dishes that make you look like a hot shot with minimal effort. Oh my goodness. I can’t even. This looks so beyond amazing! GOOD GOLLY! Obed, man, you have been seriously blessed getting to eat like this!